This piqued my interest and as Bletsoe is only about 6 kilometres away from Odell I included Bletsoe on my itinerary later in the afternoon. Pevsner’s comments prompted two questions. Are both monuments by the same hand? What is the family connection? 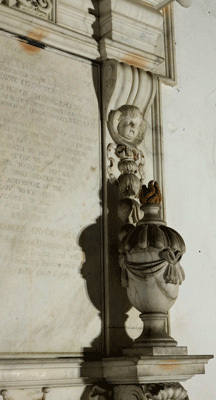 The Alston monument at Odell is located on the north wall of the chancel. It commemorates several generations of the Alston family starting with Frances (d. 1644) and her son William (d. 1637), continuing through to Vere John Alston (d. 1762), rector of Odell. The monument is fairly large and is made of white marble in three main sections. At the centre is an inscription plate divided in two with the text in black. This is flanked by pilasters adorned at the top with winged putti and pendants of foliage, flowers and ribbons terminated with tassels. The base consists of a central panel with a pair of shields in cartouches suspended from swags that are tied at the centre and at the sides to two consoles upon which are gadrooned urns with swags. The sub-base is decorated with reliefs of foliage, ribbons, and two horizontal volutes. The superstructure is dominated by an open pediment set against a semi-circular background with raised rim which is adorned with three winged putti. At the centre of the pediment is an achievement decorated with fronds and displaying the arms of Alston, azure ten etoiles or, four, three, two and one. Underneath is inscribed the prominent motto IMMOTUS. At the base of the pediment are two rectangular blocks with shields decorated with ribbons all in shallow relief. The shield on the left displays the arms of Alston impaling Blomfield and the shield on the right displays the arms of Alston impaling St John. Apart from the text none of the monument has any paintwork. The shields in the base are blank and may have always been so. There is no clear indication of when the monument was erected, but the style of the various sections of text give a clue. 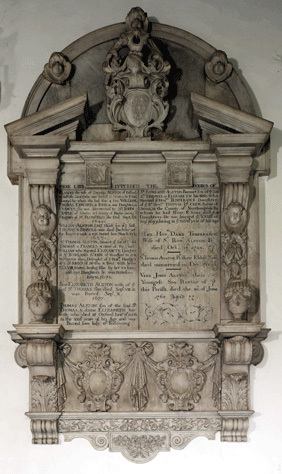 The earliest inscription is on the left-hand panel with the latest date being that of Sir Thomas Alston, 1678. This is the longest of the inscriptions. Below this is the inscription of his wife Elizabeth who died in 1677. 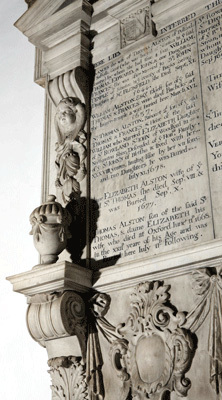 On the right hand panel the text starts with Sir Rowland Alston who died in 1697. The text is very similar in style to the left-hand panel, although the numerals are different. The inscriptions below this are by an entirely different hand. It seems reasonable to assume that the monument was erected in 1678, or just after, and the same man cut the 1697 inscription. Perhaps he was getting on in years because he made a mistake which he subsequently corrected; “ELIZABETH wife” being changed to “ELIZABETH his wife”. Supporting the 1678 date is the fact that each panel is surmounted by shields representing the earlier marriages, those of Alston and Blomfield and Alston and St John. Sir Rowland Alston married Temperance Crewe in c.1676 and the Crewe arms do not appear anywhere on the monument. 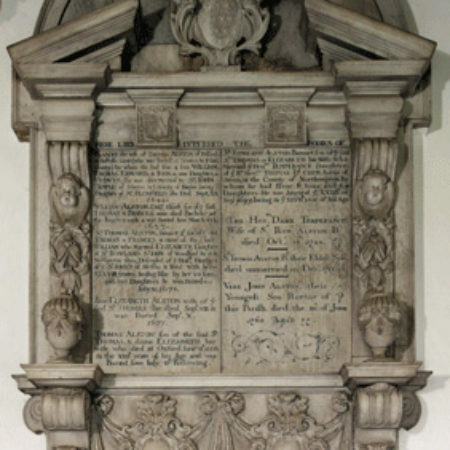 It would appear that the layout was perhaps originally designed for an inscription to Frances Alston (née Blomfield, d.1644) and her son William (1609-1637) on the left panel and Thomas (her other son) and Elizabeth (née St John) on the right. A distinct left/right heraldic grouping appears at Bletsoe as we will see. 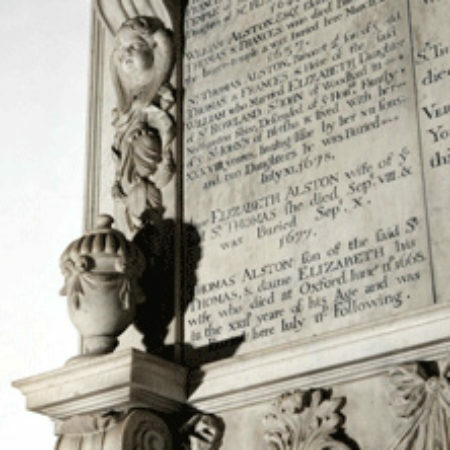 The monument at Bletsoe is inscribed to Lady Elizabeth Cavendish (Countess Bolingbroke) and can be found in the north transept of the church. This was turned into the family chapel of the St Johns and contains many minor wall tablets and four hatchments. The Cavendish monument is mounted on the east wall of the transept and is very similar to the Alston monument. The overall design is the same but some of the details are different: the urns are flaming urns, there are remains of gold paint in various locations, the putti in the superstructure are inside the rim of the semi-circular background, the blocks beneath the pediment contain crests not shields, and the shields in the base have been painted. Lady Elizabeth’s inscription is on the right-hand panel and the shield below is painted with the arms of her family, Sable three Bucks’ Heads cabossed Argent (Newcastle). Above the text is the crest of Newcastle, a Serpent nowed proper. The left-hand panel is blank and the shield is charged with the arms of St John, Argent, on a chief gules, two mullets or, while the block above the text has the crest of St John. 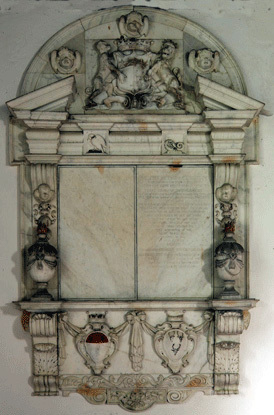 It is clear that the blank left-hand panel was intended for her husband, Oliver 2nd Earl of Bolingbroke who died in 1688. The achievement at the top is Newcastle impaling St John. The lettering of the inscription is totally different to that found on the Alston monument and gives the first clue that these two monuments are not by the same hand. Close examination of both monuments reveals the detailing to be distinctly different. 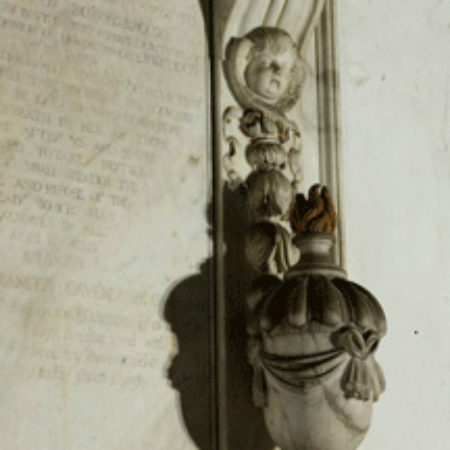 The putti heads and wings on the Alston monument are styled differently and are somewhat coarser in execution, lacking irises and having less detailed hair and feathers. The ribbons and drapery, however, have surface detailing on them whereas they are carved flat on the Cavendish. Generally the Cavendish has a blunter appearance, made up for somewhat by originally highlighting some of the details in gold paint, most of which has now flaked off. It may be that there was one designer for both monuments and they were carved by different sculptors at the same workshop. It could also be that one is a copy of the other by a different workshop, although the close parallels in design and the close timing of their manufacture tend to dictate against this. 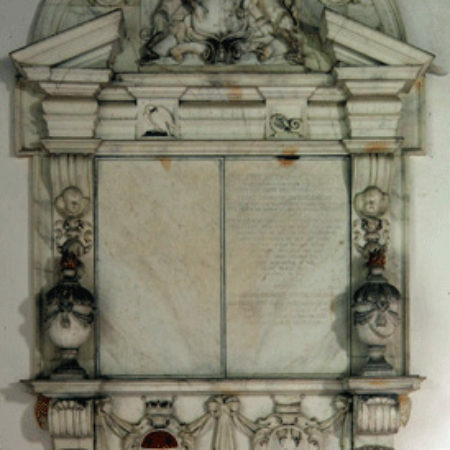 The design and layout suggests a usage as seen in the Cavendish example with one person commemorated on each inscription panel and the arms of the respective person appearing below. In this respect the Alston monument may have been selected after the Cavendish had been erected – but that is pure speculation. It might be that the design is off-the-peg, in which case it is tempting to think there may be other examples. Both monuments appear to have been erected shortly after 1678, but without documentary evidence it is not possible to say anything further. William Alston bought the manors of Great and Little Odell in 1633. As he had no issue on his death in 1638 they passed to his brother Thomas who was subsequently created a baronet in 1642. Thomas no doubt commissioned the monument at Odell. Elizabeth Cavendish was the youngest daughter of William Cavendish, 1st Duke of Newcastle-upon-Tyne, a famous polymath and grandson of Bess of Hardwick. Her mother was Elizabeth, William’s first wife. Frances or her husband considered her illustrious family’s name to be far more important than her married name as the inscription styles her “The Lady Frances Cavendish youngest daughter to his excellency William late Duke of Newcastle, wife to Oliver Earle of Bolingbrooke”. The connection between the two families is from the marriage of Thomas Alston to Elizabeth St John. Oliver 2nd Earl of Bolingbroke was a first cousin once removed of Elizabeth, as can be seen in the simplified family tree. A last word may be said on the condition of the monuments. The Alston is in good condition and is located in a well cared for environment. The Cavendish is in reasonable condition although it displays staining from the iron fastenings that fix it to the wall. The conditions in the transept are not good as it is dirty, dusty and there are water stains on the walls. The area is used for storage and on my visit the monument was partially hidden behind a stack of desks. In recent years the monument to St John St John (d. 1559) was moved into the nave where it is in fine condition. It can only be hoped that conditions improve in future for the remaining monuments in the transept.